I suspect that Haydon is intolerant of wheat and eggs. I am still not sure about diary/ soy. We are waiting for some allergy test results to accurately pin down Haydon’s allergies/ intolerance. Until then, I have been experimenting with some new recipes. 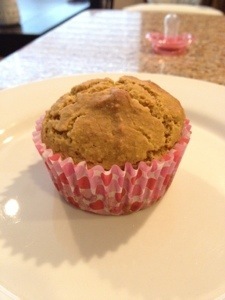 So here is a muffin that I bakes this mornings, which I adapted from Basic Vegan Banana Muffins. They are dairy, soy, egg, wheat/gluten, and nut free and made with very little sugar. Enjoy!